In my opinion, there is no easier fiber to spin on a drop spindle than silk hankies. Why? - You do all the drafting before you pick up the spindle. - The fiber has just enough tooth to not slip through your fingers uncontrollably. - It's great fun and rarely frustrating. Really encouraging for a new spinner. 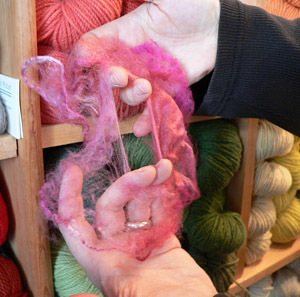 Both silk hankies and silk caps are piles of individual lighter-than-air silk cocoons, spread on a form to dry -- this gives them their shape. For hankies, it's a square, flat form. For caps, it's a bell-shaped form. I prefer hankies, because I find it easier to separate the layers. You can buy silk hankies undyed from many shops on the internet. 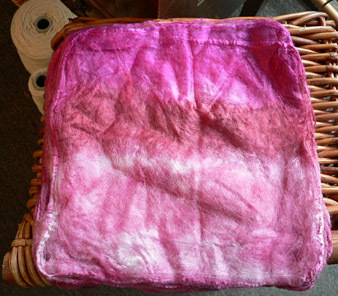 You can dye the hankies [en masse, rather than individually, cause that would just drive you mental] using any dye that works with silk, including Kool Aid. Watch Knittyspin for an article on dyeing silk hankies in a future issue. You can also buy dyed hankies. The ones shown in this article were bought from via Crown Mountain Farms, a very friendly online retailer. In all cases, my spindles are in the 1.2oz range. 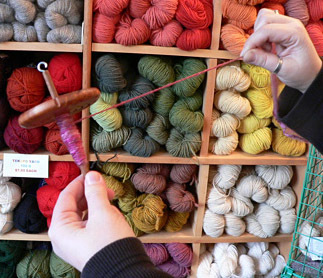 Use whatever spindle suits you and the kind of yarn you want to spin. Tip: Use an exfoliant [like a scrub you'd use for your face or body, or make a batch of one of these recipes] on your hands before you spin. Any little bit of dry skin will catch the silk as you spin and be annoying to you. Poke a hole in the center of the hanky. Insert two fingers of each hand in the hole, and pull out to widen it. You're drafting the roving into a big oval. You can tug quite firmly. Don't be shy. Keep your hands about 12" apart as you draft, because the silk fibers are quite long. If you find you can't pull apart any further, but the roving is still too thick for your liking, move your hands further apart. You may find solid bits in your hanky that refuse to be drafted once in a while. 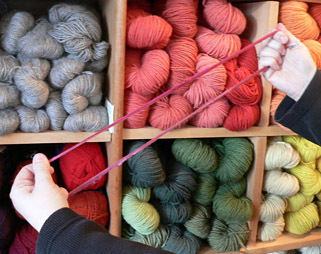 They will not take the spin well and act as slubs in your yarn. 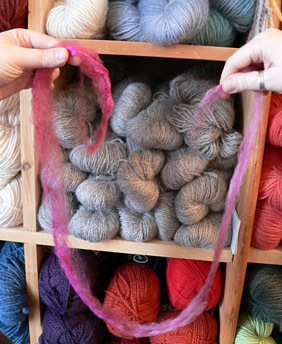 You can leave them in if you like that texture or remove them if you want a more refined yarn. Remember that the thinner you draft the roving, the thinner your yarn will be. If you want to use the hankies as singles, you'll get more shimmer if you draft less before spinning. You can use the natural distance from one knee to the other [however you sit] as a gauge to help you keep the roving thickness roughly consistent from hanky to hanky. Break the circle of roving somewhere. If you want to keep your color transitions relatively consistent, try to pick the same spot each time [for example, the place where the pale pink turns into deep burgundy]. You can knit with the roving just as it is if you like the rustic look, or give it some twist with a spindle. Personally, I like this stuff best once it's spun, so let's continue on. Decide which color to begin with [in this case, either the pale pink or the deep burgundy]. Twist a little bit of the starting end between your fingers, and then tie it around the shaft of your spindle. You're ready to spin! Tip: How do you actually get the spindle spinning? I use my left hand [though I am right handed] and roll the shaft quickly between my thumb and the rest of my fingers. My friend Emma runs her spindle along the outside of her right thigh while she's seated, which -- she tells me -- gives her greater speed and less wobble. Whatever works for you is fine. [The following assumes you've never handled a spindle before.] Take the roving over the whorl of the spindle and settle it in a notch, then loop it through the hook. Get the rest of the unused roving out of the way of the spindle, so it doesn't catch as the spindle is doing its twirly thing. I throw mine over my right shoulder. Firmly grasp the roving about 12" above the hook [we'll call the hand you're doing this with your top hand], and spin the spindle with your other hand. Remember that it doesn't really matter which way you spin the spindle, as long as you always spin one batch of roving the same way every time. You'll also need to remember which way you turned the spindle when it's time to ply that batch -- because then you're going to go in the opposite direction. 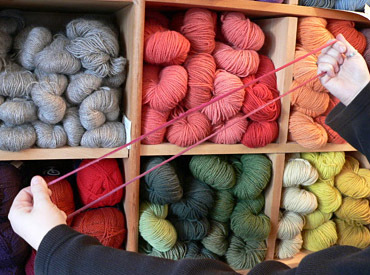 When you feel the twist reach your top hand, you're probably ready to wind most of the yarn you've just spun onto your spindle. 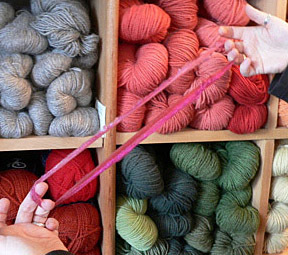 Keeping tension between the spindle and your top hand, wrap the yarn around the shaft of the spindle a few times, until it catches. Then you can twist the spindle with your other hand and the yarn will neatly wind on. Stop winding on, leaving a few inches of spun yarn to go over the whorl and through the hook. 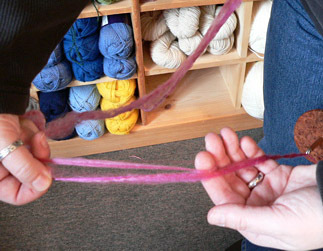 What sits immediately above the hook should be very lightly spun roving that you'd still like to put more twist into. Continue spinning and winding until you've got about 4" of unspun roving left. 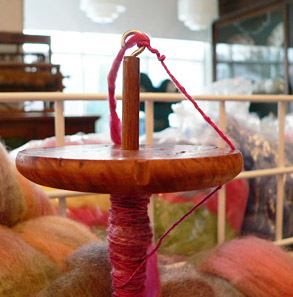 Wrap the unspun roving around the hook of your spindle a few times and set it aside. Draft another hanky's worth of roving. Now overlap the two ends of the hanky roving -- and if they're too thick, you can thin them down a little so they will equal the same width as the rest of the roving once they're spun together. The tooth of the silk hanky will help keep the roving joint from sliding apart, but you will want to keep your fingers on the top of the overlap until there is a little twist in the joint. The joint firms up really quickly once you add a little twist, and a gentle tug on the roving will show you if it's secure or needs more twist. This is one of my favorite aspects of spinning silk hankies...and something that doesn't happen when you're spinning slippery silk top or soy silk. Now you're spinning! Just keep going until you run out of hankies or need a break. 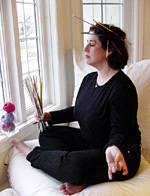 Amy R Singer is obsessed with spinning silk hankies and may never spin anything else. Special thanks to The Black Lamb for allowing us to shoot these photos at their shop.